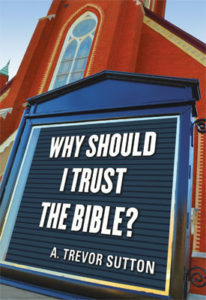 Author Trevor Sutton’s newest book Why Should I Trust the Bible? tackles head-on such accusations that question the authority of the Bible. Sutton compares the Bible to writings that have been deemed more credible than the Bible, like the Book of Mormon, encyclopedias, and even Shakespeare’s works. He tests the Bible using the same rigorous standards that have been used to test such other writings. He examines historical evidence, witness accounts, and translation concerns, answering many tough questions and showing that when all other texts fall, the Bible still stands—as completely, undeniably trustworthy. The following excerpt from chapter 4, “Disputes and Disagreements,” confronts and debunks the claim that the Gospels disagree on even the most basic events in the life of Jesus. Temptation of Jesus: A careful reading of how Matthew (4:1–11) and Luke (4:1–13) depict the temptation of Jesus will reveal a difference in the ordering of events. In Matthew, Satan tempts Jesus to turn stones into bread, then invites Him to leap from a high place, and lastly he offers Jesus all the kingdoms of the world. Luke orders the temptations differently: first Satan asks Jesus to turn stones into bread, then he encourages Jesus to claim the kingdoms of the world, and lastly there is the invitation to leap from the pinnacle of the temple in Jerusalem. This difference in the ordering of the last two temptations is often cited as proof that the Gospels do not accurately capture what happened in the life and ministry of Jesus. There is, however, a rather obvious response to this claim that is found right in the text. Matthew connects the sequence of temptations with a conjunctive adverb (then), indicating an emphasis on sequence of events: “Then the devil took Him to the holy city and set Him on the pinnacle of the temple” (Matthew 4:5). Luke connects the various temptations of Jesus with a coordinating conjunction (and), indicating a list in no particular order: “And he took Him to Jerusalem and set Him on the pinnacle of the temple and said to Him, ‘If You are the Son of God, throw Yourself down from here’ ” (Luke 4:9). Matthew places an emphasis on the chronological ordering of the events; Luke makes no indication that the list is supposed to be understood sequentially. Furthermore, Jerusalem is a reoccurring theme in the Gospel of Luke; it is no mistake that the final temptation of Jesus takes place in the holy city of Jerusalem. The Lord’s Prayer: Matthew and Luke present slightly different versions of the Lord’s Prayer as well. Luke’s version of the prayer is shorter than Matthew’s: “Father, hallowed be Your name. Your kingdom come. Give us each day our daily bread, and forgive us our sins, for we ourselves forgive everyone who is indebted to us. And lead us not into temptation” (Luke 11:2–4). Matthew’s version of the prayer includes an opening declaration that God dwells in heaven, requests that God’s will be done on earth as it is in heaven, and concludes with an appeal for divine deliverance from evil (Matthew 6:9–13). Skeptics pounce on these differences and claim that this foundational prayer is built on shaky ground. This false claim is undone with one simple question: do you think Jesus taught on prayer only once? No! Jesus taught extensively on the topic of prayer. He certainly spent a great amount of time instructing His disciples how to pray. It should also be noted that biblical prayers are not fixed incantations or formulaic statements. Ancient Jewish prayers (for example, an ancient Jewish prayer known as the Eighteen Benedictions) were abstracts or guides for how to pray. Jesus likely taught multiple versions of the Lord’s Prayer to the disciples. Even if they were not identical, they were all guides given by Jesus for how to pray. Holy Week: The final days of Jesus’ life and ministry are the most highly scrutinized days of His entire life. Scholars have sifted and pored over the biblical texts in order to determine exactly how the events unfolded. And many have determined that the Gospels epically failed in their attempt to recount the events of Holy Week. The argument is that the pieces do not fit when you try to put together the events of Holy Week as reported in Matthew, Mark, Luke, and John. There is agreement about what happened up until about Wednesday of Holy Week. The Synoptic Gospels (Matthew, Mark, and Luke) report that the Last Supper occurred around this time, while Jesus was celebrating a Passover meal: “Then came the day of Unleavened Bread, on which the Passover lamb had to be sacrificed” (Luke 22:7). The Gospel of John, however, reports that the Last Supper occurred before the celebration of the Passover: “Now before the Feast of the Passover, when Jesus knew that His hour had come to depart out of this world to the Father, having loved His own who were in the world, He loved them to the end. . . . ” (John 13:1). This makes it unclear not only on which day the Last Supper happened, but also when the subsequent trial and crucifixion of Jesus took place. Furthermore, many scholars are skeptical as to how both Jewish and Roman trials could take place between Thursday evening and Friday morning. These are commonly cited as inconsistencies and proof that the Gospels cannot be trusted. This is quite troubling. That is to say, it is troubling until you know something about ancient calendars; then these supposed discrepancies disappear. There were no atomic clocks during the time of Jesus. Determining days and times was a local approximation rather than an exact science. Furthermore, there was not a universally accepted calendar to govern the days. There were multiple calendars in use during the time of Jesus: the Julian calendar, the Egyptian lunar and solar calendars, the Qumran solar calendar, and various other Jewish calendars. Just as different communities use different calendars today—Greek and Russian Orthodox churches use the Julian calendar whereas Catholic and Protestant churches use the Gregorian calendar—there were different calendars utilized by different communities during the time of Jesus. It is reasonable to think that Matthew, Mark, and Luke were referencing one calendar while John was referencing an entirely different calendar. These texts were written for extremely diverse communities that likely gave preference to one calendar over another. There is evidence that various Jewish groups (Samaritans, Zealots, and the Essenes) utilized different calendars during the first century in Jerusalem. If the Gospels are referencing different calendars to suggest when the Last Supper occurred, then there is no real disagreement. They all agree on the same day for this momentous event; they simply utilize different reference points to mark when it occurred. These are just a few of the most common arguments people use when claiming that the Gospels should not be trusted in their depiction of Jesus. There are many other arguments that people make. And there are many other perfectly reasonable explanations. It is a worthy endeavor to read the Gospels with a scrupulous mind and ask questions when the text is unclear. Nevertheless, trying to deconstruct the Gospels as historically inaccurate is a vain endeavor. It has been done before. And it has failed every time. From Why Should I Trust the Bible? pages 83–86 © 2016 by A. Trevor Sutton. Published by Concordia Publishing House. All rights reserved. To order Why Should I Trust the Bible? please contact CPH at 800-325-3040 or visit www.cph.org.